Looking back, it certainly did get through, and spread throughout the world faster than we could have imagined, probably more so than amongst the people in that room and across the region itself. We had taken on the mission to make Le Marche famous and "bring the world to Le Marche", and we did it. Since then, so many people from all over the world have relied on Paradise Possible to find their own paradise in the Marche countryside, or special places to spend their holiday. Many have settled and reinvented their life over here, with the help of our Network, and many more have been visiting the region just to follow their passions, with Paradise Possible as their guide." Originally conceived as a pioneering territory-marketing website to launch undiscovered regions around the world, Paradise Possible is today the premier online guide to the best of Le Marche - Italy, covering Country Property,Travel & Accommodation, Food & Wine. 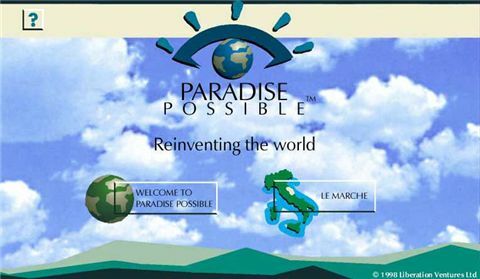 December 1998 – Paradise Possible goes live with its first interactive application (Marche Country Homes), designed to help visitors find their own paradise in the Marche countryside, coupled with a first introduction to the region (Introducing Le Marche). February 2002 – Release 2 is launched, featuring a new section dedicated to Travel & Accommodation (Traveller’s Paradise) and a new territory database architecture, as part of a joint marketing initiative with the Marche Regional Authority. Two new applications (Passions & Places and Where to Stay) allow visitors to build their own itineraries and book accommodation around them, on the basis of their passions and personal preferences. April 2005 – A fourth application dedicated to food lovers (Marche Food & Wine) is launched at La Dolce Vita 2005, London. The new section features an interactive guide to the best local products and producers, with an online shopping facility ranging over 120 prodotti tipici for home delivery across Europe (The Shop). May 2009 – Here comes Release 3, totally redesigned and on a new web platform. Easier to navigate from any point to any point and across applications, the new release offers new search, selection and save facilities, helping visitors to make each session more productive and retain search criteria and results for subsequent visits. On the editorial side, four Magazines - one for each section - provide dedicated articles and news content, whilst a totally made-over Food & Wine Shop comes packed with information about each product on sale, for the benefit of the discerning and health-conscious consumer. Welcome back to Paradise Possible!